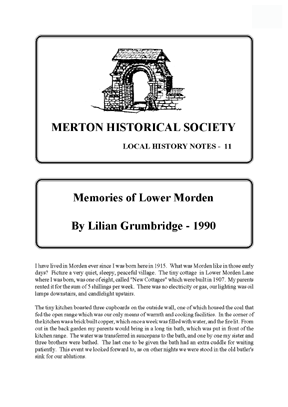 Lilian was born in one of the ‘New Cottages’ in Lower Morden Lane in 1915, and lived there until her marriage, when she moved to her present home in nearby Hillcross Avenue. Her memories of life in this tiny rural area, with its three farms, contrasts with life in the area today. Photographs and postcards are also reproduced, together with an extract from the 1933 25″ Ordnance Survey map with annotations by Bill Rudd. lamps downstairs, and candlelight upstairs. Children living in Lower Morden Lane 1st December 1920, photographed outside Morden School. row, the other is sitting fourth from left in the second row from the front. farm, providing milk for the local inhabitants. to a school, and the third has become a Garden Centre. led to what was then Battersea Cemetery. the old school built in 1731 which is now Morden Parish Hall. Sundays were always reserved for attendance at St. Lawrence parish church, opposite the school. an orange to take home. so fortunate, walked the five miles each way. centre and tube station at the end of the Northern Line. A far cry from bygone days. Time marches on. View across the fields in 1926, with Bow Lane and Morden Park boundary, now Hillcross Avenue. The Rick Yard, Lower Morden Farm in 1929, now replaced by Hatfeild School. The line of the present Hillcross Avenue is in the background. Lilian is shown here aged 13½. Cardinal Avenue, with Tudor Drive in the background. The large tree on the right continued to grow on the green in Cardinal Avenue until recent years. This entry was posted in Publications, Local History Notes and tagged in 20-century Morden, lhn, morden, Reminiscences.